However, this is a blog dedicated to science and medicine, so I feel like I would be doing a disservice if I didn’t get you the medical term. It is keriorrhea. You’ll notice that it rhymes with another, similar condition. Wikipedia defines keriorrhea as “the production of greasy, orange-colored stools which results from the consumption of indigestiblewax esters found in oil fish and escolar”. The short story is that the fish cannot metabolize the wax esters that it eats and this ends up in the tissues of the fish. When you eat the fish, it gives it a buttery texture which many people find particularly appealing and enjoyable. However, these oils are also indigestable by humans. If it can’t be digested, what goes in must come out, and thus the problems. One aspect of concern is that the fish has been used as a mislabeled substitute for white tuna in fish markets and restaurants. Although it can be called butterfish, it is important to note that there are other kinds of fish that are called butterfish that do not have this gastrointestinal property and are quite delicious, for example, Japanese butterfish. Hi, after talking some starting medical students and graduate students, it seems some people wonder how they should go about finding a good paper to go over when they have to do a journal club type report or if they just want to follow the literature in an area. Obviously, there may be particular papers that are directly in your area of research or that you need to read as background for a project, so then choosing them would be a good idea, as it saves your time and forces you to go into that paper in depth. However, there are a lot of poorly written papers out there (I know, I’ve written some stinkers). It is also unfortunate that we are exposed to so many stinkers as we go along, particularly in many niche clinical areas. The first paper draft I wrote on my own was horrible because I was emulating the terrible computer science conference papers I had read. That’s not a great model for our education. It would be like trying to teach journalism students by having them read UsWeekly and InTouch instead of the New York Times or having creative writing students studying the Twilight books. Well, that would be slightly better, because lots of people actually like UsWeekly and the Twilight books. No one likes reading a poorly written scientific paper. Instead of reading poorly written papers with lots to criticize, you can focus on great papers, and try to identify and emulated what makes them great. Usually clarity of writing and good figures are at the top of that list, along with a strong narrative hook so that you can summarize the key findings of the paper without any trouble. Check out “Faculty of a 1000”. This is sort of like reddit for science. Senior faculty around the world submit citations to papers they really like. This is broken down by discipline, and there are several different ways to access the material with different rankings and prioritizations, but the basic idea is that these are papers that established scientists really want to recommend or highlight. Academics pay a lot of attention to impact factor of journals, and although there are a lot of problems with that, one important difference between journals is how good the editing is. The top journals (NEJM, Lancet, Nature, Science, etc.) have bigger budgets and along with that, really good editing departments including art departments whose members go through every word and every figure of a paper to make it better. That’s a key service provided to you as a reader. One reason to focus on high impact journals it that sometimes the science is better, but almost always, the writing is better. As you go along and start to find a few people whose papers you really like, you can just focus on their work. One tip that I inherited from my postdoc adviser who got it from James Watson is to use this to follow a whole field. If you find a few major players in a field, you can often follow the whole field by what they write. Either they will be directly producing the new science, or they will be discussing the key developments in reviews they write or other work that they cite in their papers. You can go to PubMed and put in a search (such as for an author and affiliation) and then use that to generate an RSS feed with a single click, which will continue to provide you with citations to that person’s work. Even better, a lot of great scientists tweet or blog a lot. You just have to find a few that write well and you can follow their writings and get all the key developments a field over many years. It can be a useful exercise to always think about what could be done to improve a paper. However, you don’t need to make it easy on yourself. Your time is limited. Don’t spend it reading bad papers. Comments appreciated. Other suggestions or ideas?. It provides a lot of good geometric intuition with nice figures and clear text. 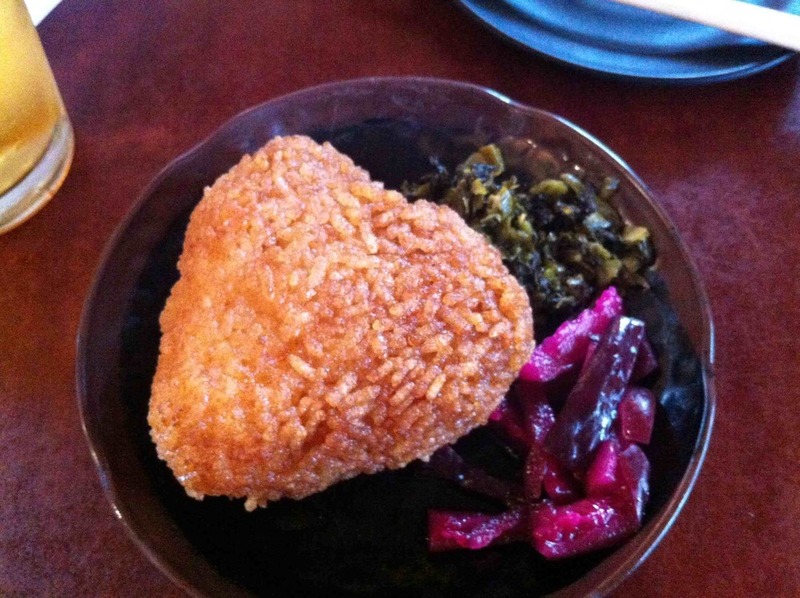 The yakionigiri (fried rice ball) with the little bit of pickle is so delicious. The plain shio (salt borth) ramen and a nice Sapporo draft. I have to be honest, it is not my favorite ramen, but it is okay. Maybe I would like it better if I ordered it without the menma. There is an interesting discussion here of the changing face of racism in college admissions policies by Ron Unz. It starts by discussing the “Asian quota” at schools replacing the “Jewish quota” of the last century. He then goes on to do a lot of analysis and discussion of other biases, such as against cultural markers of conservatism such as students belonging to certain groups (ROTC, 4H, etc. ), as well as an over-representation of Jewish students replacing the WASP bias of earlier times. I would take particular exemption to one statement in the Unz article: “Similarly, Jews were over one-quarter of the top students in the Physics Olympiad from 1986 to 1997, but have fallen to just 5 percent over the last decade, a result which must surely send Richard Feynman spinning in his grave.” Feynman was adamant for all of his career that people should not be defined by their ethnicity or background, and instead should be defined by the merit they accrued on their own. It is also telling that Caltech, the school over whom Feynman’s influence is still most strongly felt, looks like least culturally/racially biased. Ron Unz has written a lot about this subject, and his propose solution is for “elite” universities to admit a handful of the most exceptional students, and then admit the rest of the students (presuming they pass some lower barrier for minimum necessary requirements), by random chance. There is a lot to be said for this, particularly given that the metrics used for ranking students are so biased and squishy, and track so poorly with many of the measures of future “success” that you might want to use. However, a lot of this discussion ignores some of the key areas of disparity, namely the number of disadvantaged youth, particularly the non-white & non-Asian students who are both poorly represented in achievement by many of the numerical measures used (standardized tests, science/math achievements, etc.). One of my colleagues who once worked as a teacher, expressed a lot of concern about some of the students he once worked with. The disadvantaged children he worked with were in kindergarten and yet were already so far behind, that he didn’t see any way for them the catch up. And of course, as time progresses, children from disadvantaged backgrounds fall further and further behind, as we know that spending summers not in school or educational enrichment opportunities keeps these students behind. He suggested that college admissions to prioritize parental income (and presumably highest educational level achieved) more highly in admissions to help address disparities in opportunities. Gladwell’s article makes the point that pure academic merit and affirmative action are only a tiny part of the goals of higher education as an institution. Skewing toward people with family connections and the savvy to get admitted in the current byzantine system, skews towards people who are likely to be able to have “real world” success, particularly financial success which feeds back to the institution, both directly in torward of alumni donations, but also prestige by association with high achievers. It just takes a lot of work. A lot of work. The other aspect is that it takes clear role models and demonstration that children of any background can succeed through hard work. Those role models exist, but I also don’t think that they should be required to spend too much of their personal time in being direct role models. It is another level of unfairness. Just because you are black or Latino and have achieved high academic success and achievement, I don’t think that necessarily means you have to spend time being a role model for everyone of your ethnicity. High achieving members of other groups aren’t expected to do that. They are expected to just keep working hard and achieving. However, we as a culture can focus on some of the ways in which that success was achieved and let kids know that it is possible and as a society be willing to prioritize the resources and initiative to the task at hand. Part of the sad part of all these articles is that they just sort of take for a given that some of the groups are just not as well prepared. Maybe instead of focussing on educating kids, we need to start educating (disadvantaged) parents on how to be parents of high achieving kids. Maybe widespread access to educational tools like the Khan Academy can help all children, and parents of all children will make time spent working through their educational programs a priority. When I was in high school, I visited Dr Scrimshaw on his farm in New Hampshire. It was very inspiring to meet someone who really used science to deal with major public health problems in such an applied and practical way. One of the things he wanted to address better were some of the unintended consequences of public health improvements. For example, a drastic reduction in infant/child mortality can lead to a massive population explosion, with subsequent problems with social unrest. An interesting aside, in a lot of the old texbooks (60’s & 70’s) on internal medicine and infectious disease, a lot of the pictures of patients with “tropical diseases” are from him. 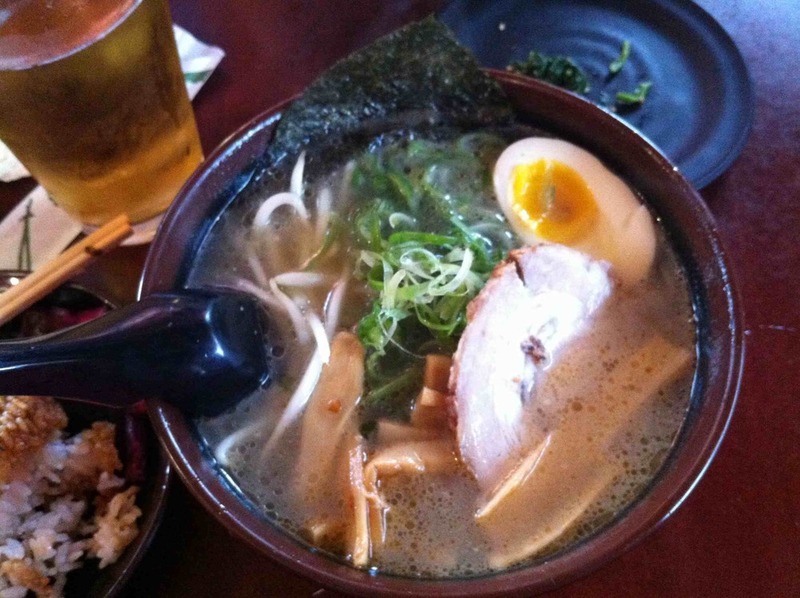 Kotetsu is a relatively newcomer in the South Bay ramen scene. I ordered the “light” ramen which includes thinner noodles. Instead of more common shio/shoyu/miso type broths, they had two main broths, both rich tonkotsu-style, but available in a shiro (“white”, sea salt flavored) or kuro (“black”, soy flavored). I got the shiro, with extra chashu and an extra delicious soft boiled egg. The karaage was good too. Everything was quite good, although perhaps nothing was particularly stand out either. The noodles had a great consistency and flavor. You can see from the picture that their house ramen is pretty standard. There was plenty of seating and no wait which is a great thing, as many good places in the area have a huge wait. I will definitely go again.